Four sets of thrusters (two of which are shown here), each consisting of four engines, controlled the attitude of the command and service module. Apparent difficulties with these engines early in the second manned period caused concern, since the thrusters were vital to the mission. Skylab's second crew discovered quickly that space missions are never routine. Ground controllers had prepared Skylab for their visit by increasing the temperature and raising the pressure inside the workshop to 5 pounds per square inch once more. 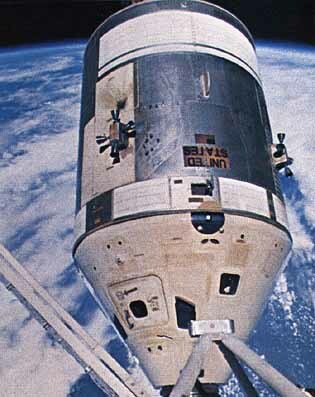 As the command and service module approached Skylab, the docking lights, transponder, and tracking lights were sequenced to assist in the rendezvous and docking maneuver. During these rendezvous maneuvers, Commander Bean reported seeing "some kind of sparklers." At the same time, ground controllers noted a pressure drop in one of the four thruster assemblies which steer the command module, and concluded that its propellant was leaking. The thruster unit was shut down, and the crew docked, using the remaining three thrusters. Six days later, ground controllers noted a pressure drop in another of the thrusters and shut it down, also. The apparent loss of this second unit began to cause concern. The command and service module control system consisted of four individual assemblies, each of which had four engines and a separate propellant feed system. The engines were mounted in a housing which also enclosed an oxidizer and a fuel manifold that fed propellants to the thruster solenoid valves. Readings of system pressures and temperatures indicated that oxidizer was leaking inside the engine housing. These thrusters were vital to operation of the spacecraft, since they oriented it so that its main rocket could fire in the proper direction for safe reentry into the Earth's atmosphere as the crew returned to Earth. With the possible loss of the second thruster assembly, Mission Control personnel began making plans for terminating the mission and for rescuing the crew, if this should become necessary. The Skylab mission had always included provisions for rescue of the crew in the event that the Apollo module lost its capability to return the crew safely to Earth. Loss of two of the four thruster assemblies would jeopardize completion of the mission, so rescue became a strong consideration. The rescue vehicle was an Apollo command and service module modified by removing the storage lockers on the aft bulkhead and installing two couches in that space, and by providing life support and communications umbilicals to accommodate a total of five crewmen who would return to Earth in it. For a rescue mission, two crewmen would occupy the rescue vehicle as it ascended into orbit. The center couch would be empty. Upon docking with the space station, the two crewmen of the rescue team would enter the space station and return with the three-man Skylab crew. Then they would return to Earth in the rescue vehicle. The rescue craft was an Apollo command module, modified to accommodate five persons. This sketch shows the rescuers and the rescued prepared for reentry of the Earth's atmosphere and a water landing. ....by instrumentation theorized that the leaks in the two thruster assemblies were unrelated. One appeared to be caused by a leaking valve, the other by loose fittings. The two remaining thruster assemblies checked out perfectly, and the decision was made to continue the mission, as planned. Computer studies and ground simulations showed that the spacecraft could be steered successfully with only two thruster assemblies, if this should become necessary. So, ground controllers advised Bean, Garriott, and Lousma that they would remain aboard Skylab for the full 59 days. Engineers used ground mockups and engineering data to develop procedures for checking out the thruster assemblies upon preparation for departure at the conclusion of the manned period. Meanwhile, another but less serious problem arose. 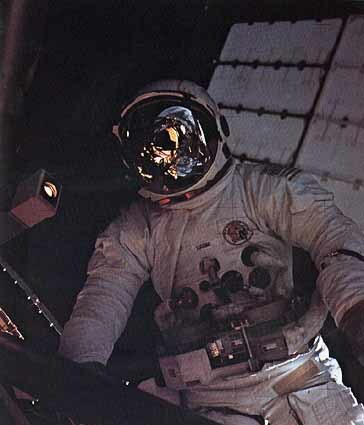 Shortly after reaching orbit, before rendezvous with the Skylab, Pilot Jack Lousma began to experience motion sickness. Each movement of the command and service module further aggravated this condition. An anti-motion-sickness pill relieved the condition so that he could participate in activating the space station upon docking. But the heavy workload further aggravated his condition, and he became nauseated after eating his first meal. 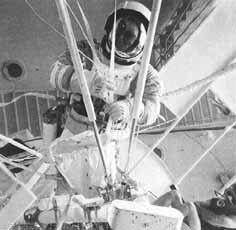 Astronaut Jack Lousma begins the extravehicular activity to erect the twin-pole shield to shade the workshop. This photograph, taken in the neutral buoyancy simulator shows the base plate which was fabricated to hold the twin poles in place. Also shown is the bag which held the fabric sail and the lines by which it was drawn into place. Deployment procedures were carefully worked out in the simulator. ...slowed by this malaise during the first 3 days, after which the symptoms subsided. By the end of the fifth day, all three astronauts had regained their strength, and were working without difficulty. Nasal congestion, which had been noted during the first manned visit, became very evident in their voice communications between the end of the third day and the early portion of the fourth day. The condition was barely noticeable to the crewmen themselves, and it caused them no discomfort. 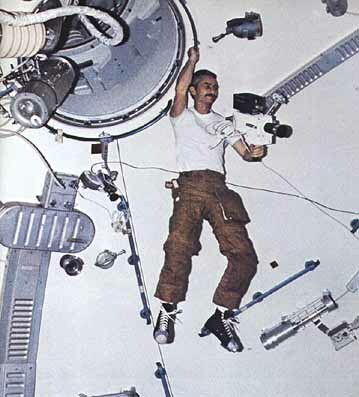 While motion sickness slowed crew activities somewhat, it did not prevent their carrying out several highly important maintenance tasks which contributed significantly to Skylab's success. On August 6, 1973, Garriott and Lousma performed an extravehicular activity which lasted 6 hours and 31 minutes, a new world record for spacewalks. During this time, they loaded film canisters in the solar observatory telescopes, installed panels to measure micrometeoroid impacts, and inspected the Apollo command and service module thrusters; they found no evidence of further leakage. They also erected a new solar shield over the parasol, which had protected the workshop since erection by the first crew, 71 days earlier. The twin-pole shield, made of fabric treated with a silicone rubber-based paint for thermal control, was designed to be suspended on a twin-pole A-frame made of long aluminum poles, the apex of which was to be attached at the solar observatory work station. This shield and the poles for erecting it had been transported to Skylab by the first crew and stowed for subsequent use. 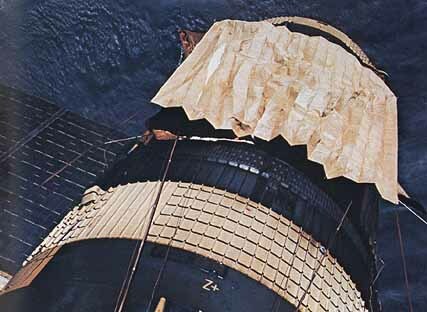 Before going outside Skylab, the crew lowered the parasol shield to a position as close to the workshop as possible. Next, Lousma crawled through the airlock hatch and worked himself hand over hand along handrails to the base of the solar observatory, where he mounted temporary foot restraints. Garriott used the extendable boom to transfer a base-plate fitting to Lousma. This fitting had been specially fabricated and was designed to hold the two sail poles firmly in position over the workshop. Highly experienced Navy Seal Team members, professional parachute riggers, used a unique accordion fold to pack the twin-pole shield before it was stowed in the command module. Concern over the possibility that materials used for the parasol would deteriorate with prolonged exposure to the Sun's rays and that more complete shielding was required to better control workshop temperatures prompted the installation of a second Sun shield during the second manned mission. This time the crew exited the space station and installed a twin-pole device to position the shield over the parasol. ....he constructed it. As Lousma received the poles, he positioned their base end into the two V-shaped receptacles on the base plate. The outward section of each pole had an eyelet through which a continuous loop of rope was threaded. Again, using the film transfer boom, Garriott passed the thermal sail package to Lousma, who hooked two corners of the folded sail onto attach rings secured to the ropes. Then he gradually pulled the ropes, sending the sail out along the poles in a manner similar to raising a flag. When the sail was fully extended along the poles, he tied off the ends of the sail to the solar observatory outrigging. The twin-pole shield was successfully erected over the parasol. A rectangular fabric shield, which was thermally treated, it remained in place for the remainder of the mission. 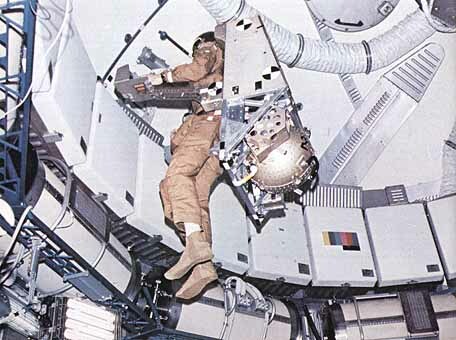 ....the zero-gravity environment, they found that they could easily work long hours without fatigue. With Skylab's systems in operation, the total power load was about 3900 watts, considerably less than the 5500 watts average power capability then available in Skylab. After full operations began, the average load requirement was 4800 watts for the first 20 days of the mission, and 5850 watts thereafter; but the power system's regulated voltage was increased, resulting in a total capability of 7000 watts. Flexibility of the power system made it possible to maintain the necessary power margin for conduct of all phases of the mission. As the mission progressed, the astronauts and ground controllers adjusted the sharing of power between the two systems to be sure that the required power margin was maintained and that batteries were not discharged excessively. Settled comfortably in their new home, the second crew began carrying out extensive scientific experiments and observations. One of their principal activities was execution of the Earth resources experiment program, which was designed to furnish a variety of observational data about areas at or near the Earth's surface. During the second manned period, Astronauts Bean, Garriott, and Lousma made nearly 16 000 photographs of Earth and recorded scientific data on about 18 miles of magnetic tape. 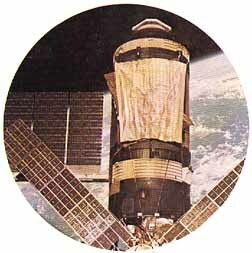 Earth observations required a reorientation of Skylab from its Sun-observing, or solar inertial, position to one which allowed the Earth resources sensors, mounted in the docking adapter, to point toward the Earth. In this Earth observation attitude, the space station was placed so that the side of the docking adapter opposite the solar observatory always faced the Earth. By contrast, in the solar inertial mode the spacecraft did not rotate as it orbited the Earth, but kept its solar arrays perpendicular to the Sun at all times. The Earth resources experiment program used a variety of scientific instruments to record data. Six major instruments recorded data in the visible, the infrared, and the microwave regions of the spectrum. These were a multispectral photographic camera, an Earth terrain camera, an infrared spectrometer multispectral scanner, a microwave radiometer/scatterometer and altimeter, and an L-band radiometer. The first four instruments were used to survey crop lands, watersheds, forest areas, geological formations, and cultural features in selected areas. Data from such instruments recorded the type and moisture content of soil, the health of vegetation, insect infestation areas, land use, and population distribution. The multispectral camera employed high-precision lenses and three different kinds of film to record data concerning the Earth never before obtained in such detail and scope. For example, a survey of the Northern Great Valley of California was made to determine identification accuracy in an area of rice and alfalfa fields, orchards, fallow fields, and dry lands. Color infrared photographs recorded data for agricultural crop surveys. The multispectral scanner measured radiation emitted from ground targets in 13 discrete frequency bands to determine characteristic Earth surface features such as lakes, grass, deciduous forests, and urban developments. The Earth resources experiment program used a variety of scientific equipment to record data concerning Earth. These instruments, located in the docking adapter, surveyed Earth features and obtained photographs which provided valuable data to foresters, geologists, oceanographers, meteorologists, and others. 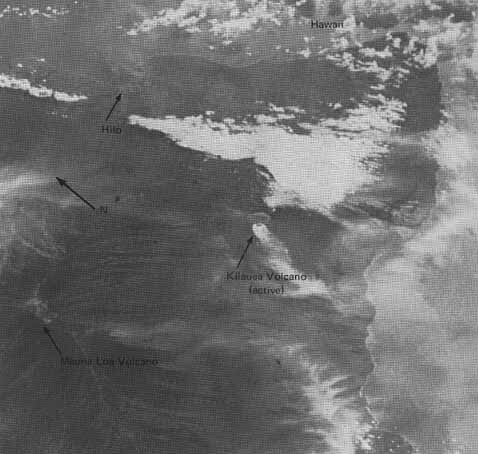 A wide variety of terrain features was recorded by Skylab's cameras: (1) The colorful plateaus of southeastern Utah, (2) lofty Mount Rainier in Washington, (3) the wind-blown dunes of the Spanish Sahara Desert, and (4) volcanoes of the Hawaiian Isles were all studied by Skylab. ....thermal patterns, and water mass variations with sportfish catches. And foresters were provided valuable data from studies of insect infestation of wooded lands. Other results of these valuable studies included the testing of the utility of such remote sensing for updating the 1970 census in 13 U.S. cities, the development of photomaps and the updating of some existing maps, and the successful demonstration of the use of space photography to map such remote regions as the "Green Hell" of Paraguay. While Earth resources observations were being intensified, the solar observations begun by the first crew were continued, with many new developments. Eight highly sensitive instruments, mounted on the spar in the solar observatory canister, studied the Sun in great detail. ....balloons, rockets, and satellites. However, the Skylab instruments were larger and more sophisticated, and they had more power at their disposal and greater data-taking capabilities than previous instruments. During the second manned period, the astronauts obtained 77 600 telescopic images of the Sun's corona in the X-ray and ultraviolet and visible-light portions of the spectrum. They spent more than 300 hours conducting astronomical observations. Most of the solar data were obtained when the Sun was high over the Earth's horizon to avoid interference from Earth's atmosphere. But some observations were made through the Earth's atmosphere to measure the constituents of the atmosphere. 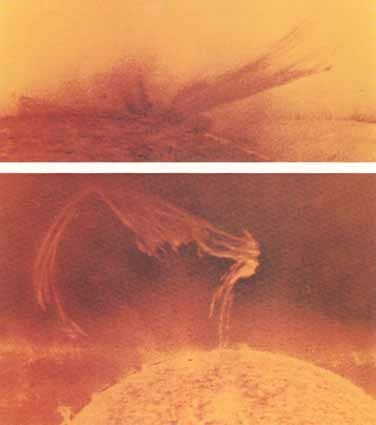 Typical of the photographs obtained by Skylab's solar instruments are these photographs of a solar eruption (top) and a solar prominence (bottom). (NAVAL RESEARCH LABORATORY). ....significant data and photographs about the quiet Sun and photographs of an active Sun, including observations of some 100 solar flares. Solar flares are massive outbursts of matter and energy from the surface of the Sun. On occasion, these flares arch back to different areas of the Sun and set off other flares. Scientists had long suspected this to be true, but had never before observed these phenomena to the extent made possible by Skylab. Studies of the corona proved the existence of coronal holes, places in the Sun's corona which are cooler and more rarefied than the rest of the solar atmosphere. These holes extend downward to the chromosphere, the region where temperatures reach a minimum. From these coronal holes, observations showed that solar magnetic fields stretch outward rather than curving back to the Sun's surface. Scientists speculate that the holes may be the source of the solar wind, the hot electrified gas particles rushing outward from the Sun along magnetic lines of force. Giant bubbles, often considerably larger than the Sun, were observed rising into the outer corona. Astronomers now believe that these bubbles may be responsible for magnetic storms on Earth. Other observations resulted in additional findings. For example, solar bright points, discovered by Skylab, occur all over the Sun rather than just in the equatorial zone where most of the Sun's violent activities take place. Coronal transients, eruptions that frequently occur in connection with solar flares, reshape much of the corona, including its magnetic fields. And condensed streams of hot gas, called prominences, occur more frequently than astronomers expected. Much of the success of Skylab's astronomical observations resulted from the continuous close contact between astronauts and ground crews. Professional astronomers manned the ground-support center throughout the entire manned period. They were supported by observatories all over the world, including a worldwide net of solar observation stations operated by the U.S. National Oceanic and Atmospheric Administration. Realtime data from the Skylab instruments were available to the astronauts, and some of these displays were transmitted to the ground. Voice communication links between Skylab and ground enabled ground crews to know what the astronauts observed and the astronauts to know what ground observatories were able to see. Using these data, a group of astronomers, engineers, and experiment teams planned each day's observations and relayed instructions to the astronauts. Even before Skylab was launched, a number of joint observation programs were developed, each structured to study one specific feature or activity on the solar disk, using as many of the Skylab astronomy instruments as possible. 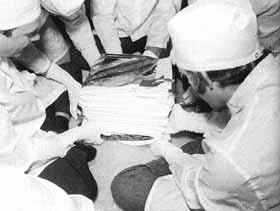 As the mission progressed, scientific teams selected the joint observation programs to be conducted each day. But the astronauts always had the option of modifying these programs based upon their realtime knowledge of solar activities. One of the principal objectives of the Skylab mission was to study life processes. Many of the experiments involved the flight crews, while others were performed with other life forms. One of the star performers of the second manned period was a common Cross spider named Arabella. She and a sister spider named Anita had been brought aboard Skylab by the second crew to participate in an experiment suggested by a high school science student. The experiment was conducted to compare the web spinning capability of the spiders on Earth and in the zero-gravity environment. 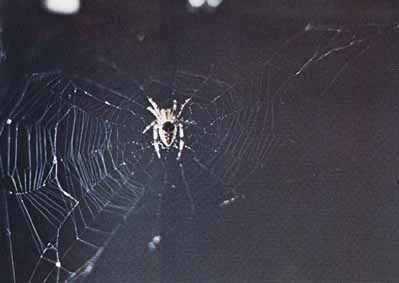 At first, Arabella had difficulty spinning her web, but when she became acclimated to the space environment, she spun webs closely resembling those she had spun on Earth. This prompted Scientist-Astronaut Garriott to observe, "It seems she learned very rapidly in zero g without the benefit of any previous experience." Later, Anita was given her chance. Already adjusted to the zero-gravity environment, she spun normal webs almost immediately. Additional experiments conducted with the Mummichog minnows provided intriguing results. Those brought aboard as minnows at first swam in tight loops. Those hatched from eggs that had been carried into space swam as they did on Earth. Arabella became a television celebrity when she spun an "earthly" web after becoming acclimated to the zerogravity environment. Her first attempt, shortly after reaching orbit, showed a disorientation, but adjustment came quickly. ...taking considerably more exercise, doctors attributed their lesser body change to this and continued to recommend at least an hour's exercise each day. The space environment seemed to act as a stimulant. Bean, Garriott, and Lousma put in long days conducting scientific experiments, making observations, and taking photographs. They slept only 6 to 7 hours a day. Working at high efficiency, they requested additional assignments. They carried out each with relative ease. By the 40th day, the gradual change in their physiological responses appeared to reach a plateau. This indicated that man has a capability to endure long-duration spaceflights. Meanwhile, Bean and his crew had to turn their attention to less glamorous, but still highly important, activities. A major problem involved the replacement in the system of six of the rate-gyroscope processors which were used to sense spacecraft attitude rates. There were three such rate gyroscopes for each of the three vehicle axes. Within the first 21 hours after the initial launch, four of the rate-gyroscope processors overheated. Subsequently, two more showed identical symptoms. In addition, upon activating the Skylab control system, it quickly became apparent that many of the processors were behaving abnormally. Here, Comdr. 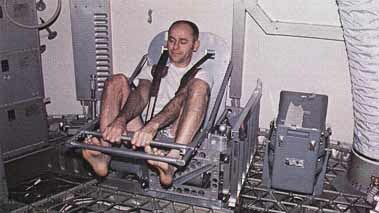 Alan Bean conducts tests to measure body mass in zero gravity. Drift rates were 18 times higher than expected, which made it difficult to maintain the correct attitude for thermal control during the first l O days after launch. But, as time passed, the drift rates decreased and eventually stabilized. Again, engineering teams on the ground were set to work analyzing the problem. They determined that the high drift rates were caused by gas bubbles forming in the gyro flotation fluid and were aggravated by the overheating of the gyroscope fluid caused by problems in an electronic control circuit. The design allowed the float-chamber bellows to be exposed to the hard vacuum of space thereby relieving the fluid pressure within the bellows and allowing entrained gas present in the fluid to form bubbles. Tests conducted to verify the theory of bubble formation showed that the theory was correct. 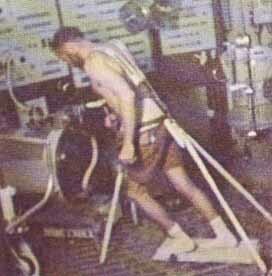 Astronaut Carr keeps in shape using the exerciser on Skylab 4. The treadmill was assembled in space by the second crew and used throughout the rest of the mission. ....overheating problem was also solved by modifying the mounting of some of the critical electronic components. Six such modified gyroscope processors, packaged in a "rate-gyroscope six-pack," were stowed aboard the command module and transported to Skylab by the second crew. Installing this six-pack in Skylab required that cables outside the spacecraft be disconnected and reconnected during a spacewalk. The second crew first installed the six-pack in the docking adapter near the control and display panel, on a mount previously provided for camera stowage. This location was close to the spacecraft center of gravity and was near a high-power outlet. All three crewmen participated in connecting the six-pack. 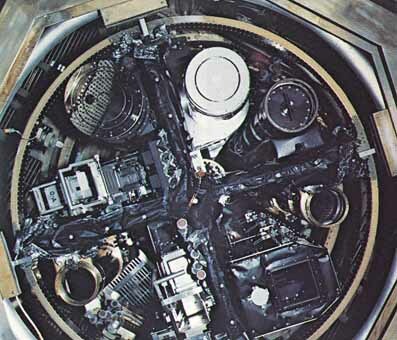 While Bean remained inside, Garriott and Lousma went into space to perform the very difficult task of disconnecting three cable connectors and installing the new cable and rate-gyroscope selector box, which required making four connections. Since this activity involved disconnecting the guidance system's main cable and making new connections, its successful execution was vital to continuing the mission. The astronauts were able to accomplish the task without incident, however, using special tools which had been supplied for this task. 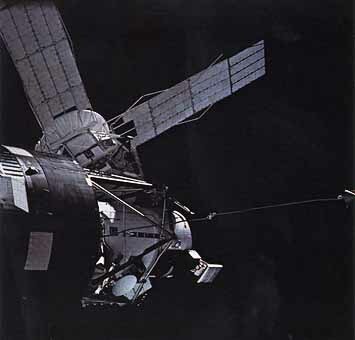 Many Skylab systems were interdependent. Performance of one often depended upon proper operation of another. As one example, concern arose during the second manned period when the primary airlock coolant loop was shut down because of a suspected loss of coolant fluid. With only one coolant loop in operation during the period which would follow departure of the second crew, there would be no backup system available. A failure of this coolant loop would leave the laboratory power conditioners without coolant flow, which would require shutting down the batteries and electronic components in the power conditioners to insure their availability during the third manned period. The usual procedure would have been to open the battery and regulator outputs by ground command and allow the solar observatory to supply the total power until the third crew could resupply the coolant fluid. This operation, however, would have removed power from the workshop control bus, removing command capability from the system. Engineers decided that the proper way to power down in the event of a coolant flow loss was to leave the regulator output relay closed, and reduce the regulator voltage. In this mode, the solar observatory would provide all of the power to the vehicle, effectively reducing the laboratory power output to zero. This would allow power to flow to the control bus through the regulator from the solar observatory. Because the regulator voltage could only be adjusted manually, that had to be done immediately before the crew's departure. This would have placed the entire electrical load on the solar observatory for the entire unmanned period to follow, which was undesirable. For that reason, the transfer relays were opened. The resultant 27 volts was sufficient to power the loads, and the transfer relays were left in the open position, with each system operating independently. If the coolant loop had failed, the transfer relays would have to be closed and the system would operate in the contingency mode. Fortunately, the secondary coolant system operated satisfactorily during the unmanned period, and the transfer relay was left open until after the arrival of the third crew. At the end of the second manned period, the crew had performed well above expectations. Twenty-six Earth surveys had been scheduled; they performed 39. They had been scheduled to spend 206 hours in solar observation; instead, they spent 305, which resulted in 71 700 photographs of the Sun, a staggering bonanza of scientific data. In three extravehicular activities, they made necessary repairs and adjustments. They conducted extensive biomedical and life sciences experiments and proved beyond doubt man's capability to live and work in space. Throughout the manned period, they carried on continuous communication with ground personnel, working as a closely integrated team. Each problem was discussed in great detail, and the final solution was the result of agreement between engineers, scientists, and technicians on the ground and the highly trained Skylab crewmen. "Hello, Houston, this is Skylab. Are you reading me down there?" There was an understandably long silence from Mission Control. "Hello, Houston, are you reading Skylab?" the  voice called again. No mistake about it. It was clearly a woman's voice. After another long pause, Mission Control replied, hesitantly, "Skylab, this is Houston. I heard you all right, but I had a little difficulty recognizing your voice. Who have we got on the line here?" "Houston, Roger. I haven't talked with you for a while. Is that you down there, Bob? This is Helen here in Skylab. The boys hadn't had a home-cooked meal in so long, I thought I'd just bring one up. Over." "Roger, Skylab. I think somebody has got to be pulling my leg. Helen, is that really you? Where are you?" "Just a few orbits ago we were looking down on the forest fires in California. You know, the smoke sure does cover a lot of territory. And, oh, Bob, the sunrises are just beautiful." Suddenly the feminine voice changed moods. "Oh, oh, I have to cut off now," she said. "I see the boys are floating up toward the command module, and I'm not supposed to be talking to you. See you later, Bob." Still somewhat shaken by the event, the controller muttered, "Bye, bye," as the Skylab crew roared with laughter. Garriott had taped his wife's voice earlier and played it back at an opportune moment. An astronaut maneuvering unit, shown here, was flown in the workshop to test it under weightless conditions for possible future application. Garriott displays the lightweight portable television camera which the astronauts used to televise their activities.